The Meuse-Argonne Offensive (also known as Battles of the Meuse-Argonne and the Meuse-Argonne Campaign) was a major part of the final Allied offensive of World War I that stretched along the entire Western Front. It was fought from September 26, 1918 until the Armistice of November 11, 1918, a total of 47 days. The Meuse-Argonne Offensive was the largest in United States military history, involving 1.2 million American soldiers. It was one of a series of Allied attacks known as the Hundred Days Offensive, which brought the war to an end. The battle cost 28,000 German lives, 26,277 American lives and an unknown number of French lives. It was the largest and bloodiest operation of World War I for the American Expeditionary Force (AEF) even if, given the scale of other battles on the Western Front, its size was limited and the operation itself secondary as it was far from the main offensive axis. It was the deadliest battle in American history. U.S. losses were exacerbated by the inexperience of many of the troops, the tactics used during the early phases of the operation and the widespread onset of the influenza outbreak called the "Spanish Flu". 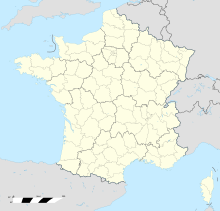 Meuse-Argonne was the principal engagement of the AEF during World War I. The logistic prelude to the Meuse attack was planned by then Colonel George Marshall who managed to move American units to the front after the Battle of Saint-Mihiel. 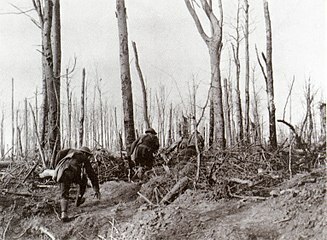 The September/October Allied breakthroughs (north, centre, and east) across the length of the Hindenburg Line – including the Battle of the Argonne Forest – are now lumped together as part of what is generally remembered as the Grand Offensive (also known as the Hundred Days Offensive) by the Allies on the Western Front. The Meuse-Argonne offensive also involved troops from France, while the rest of the Allies, including France, Britain, and its dominion and imperial armies (mainly Canada, Australia, and New Zealand), and Belgium contributed to major battles in other sectors across the whole front. The Meuse-Argonne battle was the largest frontline commitment of troops by the U.S. Army in World War I, and also its deadliest. Command was coordinated, with some U.S. troops (e.g. the Buffalo Soldiers of the 92nd Division and the 93rd Division) attached and serving under French command (e.g. XVII Corps during the second phase). The main U.S. effort of the Meuse-Argonne offensive took place in the Verdun Sector, immediately north and northwest of the town of Verdun, between September 26 and November 11, 1918. Far to the north, U.S. troops of the 27th and 30th divisions of the II Corps AEF fought under British command in a spearhead attack on the Hindenburg Line with 12 British and Australian divisions, and directly alongside the exhausted veteran divisions of the Australian Corps of the First Australian Imperial Force (1st AIF). With artillery and British tanks, the combined three-nation force, despite some early setbacks, attacked and captured their objectives (including Montbrehain village) along a six-kilometre section of the Line between Bellicourt and Vendhuille, which was centred around an underground section of the St. Quentin Canal and came to be known as the Battle of St. Quentin Canal. 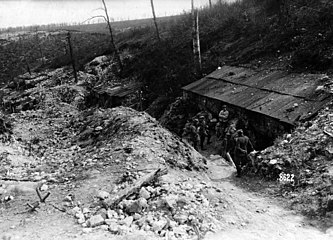 Although the capture of the heights above the Beaurevoir Line by October 10, marking a complete breach in the Hindenburg Line, was arguably of greater immediate significance, the important U.S. contribution to the victory at the St. Quentin Canal is less well remembered in the United States than Meuse-Argonne. The American forces initially consisted of 15 divisions of the U.S. First Army commanded by General John J. Pershing until October 16 and then by Lieutenant General Hunter Liggett. The logistics were planned and directed by then Colonel George C. Marshall. The French forces next to them consisted of 31 divisions, including the Fourth Army (under Henri Gouraud) and the Fifth Army (under Henri Mathias Berthelot). The U.S. divisions of the AEF were oversized (12 battalions per division versus the French-British-German nine battalions per division), being up to twice the size of other Allies' battle-depleted divisions upon arrival, but the French and other Allied divisions had been partly replenished prior to the Grand Offensive, so both the U.S. and French contributions in troops were considerable. Most of the heavy equipment (tanks, artillery, and aircraft) was provided by the Allies. For the Meuse-Argonne front alone, this represented 2,780 artillery pieces, 380 tanks, and 840 planes. As the battle progressed, both the Americans and the French brought in reinforcements. Eventually, 22 American divisions participated in the battle at one time or another, representing two full field armies. Other French forces involved included the 2nd Colonial Corps, under Henri Claudel, which had also fought alongside the AEF at the Battle of Saint-Mihiel earlier in September 1918. The opposing forces were wholly German. During this period of the war, German divisions procured only 50 percent or less of their initial strength. The 117th Division, which opposed the U.S. 79th Division during the offensive's first phase, had only 3,300 men in its ranks. Morale varied among German units. For example, divisions that served on the Eastern front had high morale, while conversely divisions that had been on the Western front had poor morale. Resistance grew to approximately 200,000–450,000 German troops from the Fifth Army of Group Gallwitz commanded by General Georg von der Marwitz. The Americans estimated that they opposed parts of 44 German divisions overall, though many fewer at any one time. "During the three hours preceding H hour, the Allies expended more ammunition than both sides managed to fire throughout the four years of the [American] Civil War. The cost was later calculated to have been $180 million, or $1 million per minute." The American attack began at 05:30 on September 26 with mixed results. The V and III Corps met most of their objectives, but the 79th Division failed to capture Montfaucon, the 28th "Keystone" Division's attack virtually ground to a halt due to formidable German resistance, and the 91st "Wild West" Division was compelled to evacuate the village of Épinonville though it advanced 8 km (5.0 mi). The inexperienced 37th "Buckeye" Division failed to capture Montfaucon d'Argonne. The subsequent day, September 27 most of 1st Army failed to make any gains. The 79th Division finally captured Montfaucon and the 35th "Santa Fe" Division captured the village of Baulny, Hill 218, and Charpentry, placing the division forward of adjacent units. On September 29, six extra German divisions were deployed to oppose the American attack, with the 5th Guards and 52nd Division counterattacking the 35th Division, which had run out of food and ammunition during the attack. The Germans initially made significant gains, but were barely repulsed by the 35th Division's 110th Engineers, 128th Machine Gun Battalion, and Harry Truman's Battery D, 129th Field Artillery. In the words of Pershing, "We were no longer engaged in a maneuver for the pinching out of a salient, but were necessarily committed, generally speaking, to a direct frontal attack against strong, hostile positions fully manned by a determined enemy." The German counterattack had shattered so much of the 35th Division—a poorly led division, most of whose key leaders had been replaced shortly before the attack, made up of National Guard units from Missouri and Kansas—that it had to be relieved early, though remnants of the division subsequently reentered the battle. Part of the adjacent French attack met temporary confusion when one of its generals died. Nevertheless, it was able to advance 15 km (9 mi), penetrating deeply into the German lines, especially around Somme-Py (the Battle of Somme-Py (French: Bataille de Somme-Py)) and northwest of Reims (the Battle of Saint-Thierry (French: Bataille de Saint-Thierry)). The initial progress of the French forces was thus faster than the 3 to 8 km (2 to 5 mi) gained by the adjacent American units, though the French units were fighting in a more open terrain, which is an easier terrain from which to attack. The second began on October 4, when the first assault divisions (the 91st, 79th, 37th and 35th) were replaced by the 32nd, 3rd and 1st Divisions. The 1st Division created a gap in the lines when it advanced 2.5 km (1.6 mi) against the 37th, 52nd, and 5th Guards Divisions. [vague] It was during this phase that the Lost Battalion affair occurred. The battalion was rescued by an attack by the 28th and 82nd Divisions (the 82nd attacking soon after taking up its positions in the gap between the 28th and 1st Divisions) on October 7. The Americans launched a series of costly frontal assaults that finally broke through the main German defenses (the Kriemhilde Stellung of the Hindenburg Line) between October 14–17 (the Battle of Montfaucon (French: Bataille de Montfaucon)). By the end of October, U.S. troops had advanced ten miles and had finally cleared the Argonne Forest. On their left the French had advanced twenty miles, reaching the Aisne River. It was during the opening of this operation, on October 8, that Corporal (later Sergeant) Alvin York made his famous capture of 132 German prisoners near Cornay. By October 31, the Americans had advanced 15 km (9.3 mi) and had finally cleared the Argonne Forest. On their left the French had advanced 30 km (19 mi), reaching the River Aisne. The American forces reorganized into two armies. The First, led by General Liggett, moved to the Carignan-Sedan-Mezieres Railroad. The Second Army, led by Lieutenant General Robert L. Bullard, was directed to move eastward towards Metz. The two U.S. armies faced portions of 31 German divisions during this phase. The American troops captured German defenses at Buzancy, allowing French troops to cross the River Aisne, whence they rushed forward, capturing Le Chesne (the Battle of Chesne (French: Bataille du Chesne)). In the final days, the French forces conquered the immediate objective, Sedan and its critical railroad hub (the Advance to the Meuse (French: Poussée vers la Meuse)), on November 6 and American forces captured surrounding hills. On November 11, news of the German armistice put a sudden end to the fighting. ^ a b c d Hart, Keith (1982). "A Note on the Military Participation of Siam in the First World War" (PDF). Journal of the Siam Society. p. 135. Retrieved July 19, 2015. ^ Ferrell, Robert H. (2007). America's Deadliest Battle: Meuse-Argonne, 1918. University Press of Kansas. ISBN 978-0-7006-1499-8. LCCN 2006029077. ^ a b c "Meuse River-Argonne Forest Offensive, 26 September-11 November 1918". Historyofwar.org. Retrieved September 26, 2013. 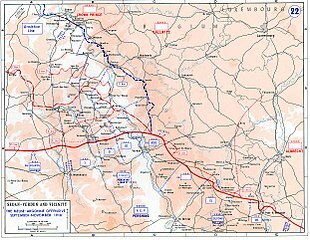 ^ "Hindenburg Line and Montbrehain, 27 September – 5 October 1918". Australians on the Western Front 1914–1918: An Australian journey across the First World War battlefields of France and Belgium. Department of Veteran's Affairs, Australian Government. November 2008. Archived from the original on July 14, 2013. Retrieved September 2, 2018. ^ "30th-Division in WWI". Battlefield Tour Guide. Archived from the original on May 19, 2008. Retrieved September 2, 2018. ^ a b "Situation au debut D'Octobre 1918 (Situation at the beginning of October 1918)". Retrieved October 8, 2009. ^ "The Meuse-Argonne Offensive: Part II: Pershing's Report". The Great War Society. Retrieved January 15, 2008. ^ Ferrell, Robert H. (2004). Collapse at Meuse-Argonne: The Failure of the Missouri-Kansas Division. University of Missouri Press. ISBN 978-0-8262-6239-4. LCCN 2004004300. ^ "35th Infantry Division (Mechanized) 'The Santa Fe Division'". GlobalSecurity.org. Retrieved May 15, 2009. ^ Fleming, Thomas (October 1993). "Meuse-Argonne Offensive of World War I". Military History. HistoryNet.com. ^ "Novembre 1918 (November 1918)". Retrieved October 8, 2009. Baker, Horace Leonard (2007). Ferrell, Robert H., ed. Argonne Days in World War I. Columbia, Mo. : University of Missouri Press. ISBN 978-0-8262-6575-3. Ferrell, Robert H. (2008). The Question of MacArthur's Reputation: Côte de Châtillon, October 14-16, 1918. Columbia, Mo. : University of Missouri Press. ISBN 978-0-8262-6651-4. Ferrell, Robert H. (2011). Unjustly Dishonored: An African American Division in World War I. Columbia, Mo. : University of Missouri Press. ISBN 978-0-8262-1916-9. LCCN 2012462746. Stackpole, Pierpont L. (2009). Ferrell, Robert H., ed. In the Company of Generals: The World War I Diary of Pierpont L. Stackpole. Columbia, Mo. : University of Missouri Press. ISBN 9780826218704. LCCN 2009028219. Triplet, William S. (2000). Ferrell, Robert H., ed. A Youth in the Meuse-Argonne: A Memoir, 1917–1918. Columbia, Mo. : University of Missouri Press. ISBN 0-8262-1290-5. LCCN 00029921. OCLC 43707198. Wright, William M. (2004). Ferrell, Robert H., ed. Meuse-Argonne Diary: A Division Commander in World War I. Columbia, Mo. : University of Missouri Press. ISBN 978-0826215277. OCLC 70757341. "General Pershing and the Battle of Meuse-Argonne". C-SPAN. March 22, 2016. "To Conquer Hell". C-SPAN. February 6, 2008.